The following article was written by renowned sailor and electrical engineer Stan Honey. It appeared in the October 15, 1996 issue of Practical Sailor magazine. Honey is a highly decorated competitive sailor with a sublime record as an ocean navigator. His victories include the 2005–06 Volvo Ocean Race and 11 wins in the Pacific Transpac race. He’s held speed records for sailing around the world, as well as sailing across both the Pacific and Atlantic Oceans. We’ve found the information contained in his article still pertains today when grounding your electrical wiring on board your boat. ground n. 12. Electricity. A large conducting body, such as the earth or an electric circuit connected to the earth, used as an arbitrary zero of potential. In a normal house on land, the problem of grounding is simple. It consists of the green grounding wire in the AC wiring system and serves the purpose of preventing shocks or electrocution. The ground connection is usually made by clamping to a metal water pipe or by driving a long copper stake into the ground. On a boat, things are considerably more complicated. In addition to the AC ground, we need a DC ground or return line, a lightning ground, and a RF ground plane for the radio systems. Our first thought might be to simply make the ground connection to a metal thru-hull, propeller shaft or other underwater metal. This underwater metal will be grounded by connection to the seawater will serve as our water pipe. Unfortunately, a connection between any of these systems and underwater metal can, and probably will, give rise to serious electrolytic corrosion problems. 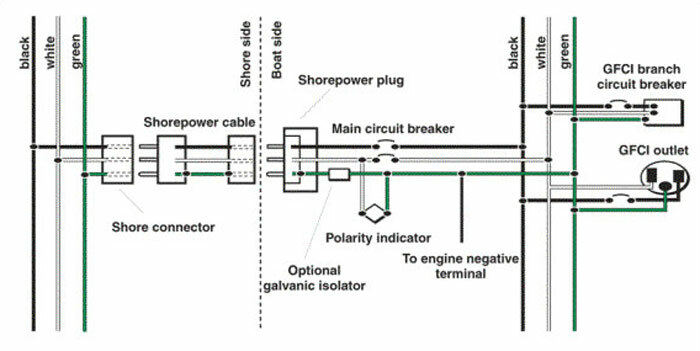 This article will discuss the particular requirements of each system, resolve the contradictions between the systems and present a consistent and correct solution for a complete, integrated, marine grounding system. Figure 1. 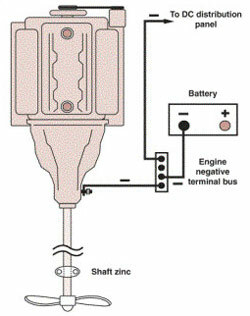 The boat's electrical system should be connected to seawater at one point only, via the engine negative terminal or its bus. Every light or appliance should be wired with its own DC return wire. Never use the mast, engine, or other metal object as part of the return circuit. The DC load returns of all branch circuits should be tied to the negative bus of the DC distribution panel. In turn, the negative bus of the DC distribution panel should be connected to the engine negative terminal or its bus. The battery negative is also connected to the engine negative terminal or its bus. The key factor here is that the yacht's electrical system is connected to seawater ground at one point only, via the engine negative terminal or its bus. See figure one. See Practical Sailor, August 15, 1995 for a detailed treatment of the green wire. The best solution is a heavy and expensive isolation transformer. The acceptable solution (for the rest of us) is to install a light and inexpensive Galvanic Isolator in the green wire, between the shorepower cord socket on your boat, and the connection to the boat's AC panel. Then, connect the grounding conductor (green) of the AC panel directly to the engine negative terminal or its bus. Note that this meets the ABYC recommendation. In choosing Galvanic Isolators, make sure that you select one that has a continuous current rating that is at least 135% the current rating on the circuit breaker on your dock box. Certain Galvanic Isolators (e.g. Quicksilver) include large capacitors in parallel with the isolation diodes, which in certain situations theoretically provide better galvanic protection. Unfortunately, these units cost substantially more than conventional Galvanic Isolators. If you feel like spending real money on galvanic isolation, you might as well do it right and buy an isolation transformer. It is also a good idea to use a Ground Fault Circuit Interrupter (GFCI) in your AC wiring. GFCI's will occasionally "nuisance trip" due to the humidity surrounding the wiring on boats, but the additional safety that they offer (particularly to nearby swimmers) in disconnecting power in the presence of ground currents is worth the nuisance. If your GFCI starts to nuisance trip, it is probably a very good idea to track down and clean up your damp wiring in any event. Figure 2. Ground fault circuit interrupters (GFCI) should be installed in each AC circuit. A GFCI will disconnect power in the presence of ground currents, helping prevent an electrocution. Connect a 4 AWG battery cable from the base of your aluminum mast to the nearest keel bolt from external ballast. If you have internal ballast, you should install a lightning ground plate. One square foot is recommended for use in salt water; fresh water requires much more. Do not rely on a thru-hull or a sintered bronze radio ground (e.g. Dynaplate) for use as a lightning ground. For additional comfort, also run a 6 AWG wire from your keel bolt or ground plate to the upper shroud chainplates, and to your headstay chainplate. Don't bother with the backstay if it is interrupted with antenna insulators. Have each of the cables that are used for lightning ground wires lead as directly as possible to the same keel bolt, with any necessary bends being smooth and gradual. Given that you have grounded your mast solidly to the ocean, your mast will be at exactly the same electric potential as the ocean. There is no chance that you can dissipate the charge between the ocean and the atmosphere, so don't bother with a static dissipater at the masthead. Wire "bottle brush" static dissipaters may be useful to dissipate seagulls, however, but that is beyond the scope of this article. Your VHF doesn't need to use the ocean as a counterpoise, so here we are dealing only with the ground needed for your HF/SSB radio. Mount your automatic tuner as close to the backstay as possible, preferably just under the after deck. Run copper ground tape from the tuner to the stern pulpit/lifelines, to the engine, and to a keel bolt. It is good practice to include the HF/SSB radio itself in this network of ground tapes. If the builder of your yacht had the foresight to bond into the hull a length of copper tape or an area of copper mesh, be sure to run a copper ground tape to this as well, and say a blessing for builders such as these. Sintered bronze ground plates (e.g. Dynaplates) can be used as radio grounds in situations where the ballast or engine is unavailable or awkward to connect. If the ballast, engine, and lifelines are available, however, they generally make a high performance ground. Do not bond any thru-hulls or other immersed metal that can be electrically isolated. Specifically, keep your metal keel/ballast, your metal rudder shaft, your engine/prop, and all thru-hulls electrically isolated, from each other, and from the engine. It's worth understanding the reason. In an increasing number of marinas, there are substantial DC electric currents running through the water. If your bits of immersed metal are bonded, the electric current will take the lower resistance path offered by your boat in preference to the water near your boat, and the current will flow into one of your bits of metal, through your bonding wires, and then out another bit of metal. The anodic bit of metal or thru-hull that has the misfortune to be on the "out current" side of the current running through your bonding system will also become "out metal" and will disappear, sometimes rapidly. Your zinc is only intended to protect against the modest galvanic potentials and therefore currents that are caused by the dissimilar metals that are immersed and electrically connected together on your own boat. Your zinc is incapable of supplying enough galvanic potential to protect against substantial DC currents that may be flowing in the water. These DC currents in the water will cause electrolytic corrosion to your bonded thru-hulls or metal parts. Use zincs to protect against the galvanic currents that are set up by dissimilar metals on your boat that are immersed and that are in electric contact with one another. The best example is your bronze propeller on a stainless shaft. The best protection is to put a zinc right on the shaft next to the propeller, or a zinc on the propeller nut. An isolated bronze thru-hull doesn't need protection because it is not in electrical contact with another immersed dissimilar metal. If electrically isolated, high quality marine bronze, is electrochemically stable in seawater; nothing good can come from connecting wires to it. Figure 3. Conductors running from the external keel or ground plate to the mast, stays and to the metal fuel tank will protect against a lighting strike, and there will be no DC connections to the engine or to the electrical system. Stainless steel is a special case. Generally, it is a bad idea to use stainless steel underwater, because it can pit. When it pits the "nobility" of the metal changes locally, and you end up with tiny galvanic couples that are made up of different parts of the same piece of metal and the pits grow deeper. One school of thought suggests that if you must use stainless steel underwater (e.g. you need its strength), then you should connect a nearby, immersed zinc to it; this protects the stainless steel from itself, reducing the rate of pitting. The electrochemistry of this assertion is compelling enough to recommend that you protect a stainless steel rudder shaft with a zinc. 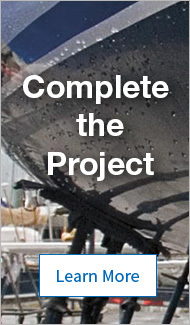 This may be done by mounting a zinc on the hull near the rudder shaft, and electrically connect it (inside the hull) to the stainless rudder shaft. For the reasons described above, ensure that your metal rudder shaft is not electrically connected to anything else. Your stainless steel propeller shaft will be protected from itself, by the same shaft zinc that protects the propeller from the stainless steel shaft. In both cases the pits, if they appear, will appear where the stainless steel is not exposed to the water. Trouble areas are in the cutlass bearing, inside the rudder bearing, and just inside the top of the rudder. Keep your metal keel/ballast electrically isolated from all other bits of metal. If you have the misfortune to have an external iron or steel keel, however, mount a zinc directly on it to reduce the rate of corrosion. Leave lead keels/ballast isolated. Figure 4. To avoid making another DC ground to the engine via the HF/SSB radio copper ground strip, fasten the copper tape securely to an insulating piece of phenolic or to a terminal strip, cut a 1/10" gap across the tape, and solder several 10.15 uF ceramic capacitors across the gap. So now, you are annoyed with the inconsistencies. We said to leave all bits of immersed metal electrically isolated when we described electrolytic corrosion and hot marinas, but then we said to connect wires and copper tape to your keel and engine for lightning and RF grounds. So what to do? RF ground. The RF ground needs to be a ground for RF signals only. It does not need to conduct DC, and as described in "Bonding and Electrolytic Corrosion..." above, you do not want to connect another DC ground to your engine and to your keel etc. The solution is to find a dry secure place along each of the copper RF ground tapes that are running to your engine and keel. Fasten the tape securely to an insulating piece of phenolic or to a terminal strip, cut a 1/10-inch gap across the tape, and solder several 0.15uF ceramic capacitors across the gap. These capacitors will be transparent to the RF, which will be happily grounded by the ground tape system, but they will block any DC currents from running through the RF ground system, and will avoid any resulting susceptibility to hot marina electrolytic corrosion. It is worth selecting the capacitors carefully, because they may carry a significant amount of RF current. The lightning ground needs to be a direct DC connection to the keel or to a ground plate to handle currents due to lightning strikes. So how do we keep the keel or ground plate electrically isolated as required in "Bonding and Electrolytic Corrosion..." above? 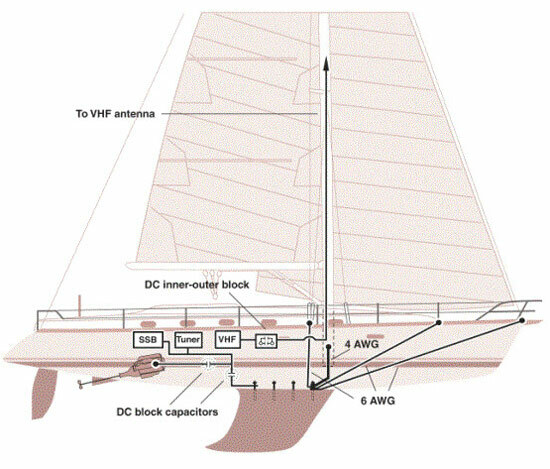 The solution is to connect the keel or ground plate directly to the mast, but make sure the mast is not electrically connected to the boats DC ground system. If your steaming light, masthead light, tricolor, Windex light etc. are wired carefully and correctly, they each will have their own DC return wire; there should be no ground connection between their wiring and the mast itself. Make sure that this is the case. This should also be true of your masthead instruments. The unintended DC connection between mast and DC ground is typically made by the masthead VHF whip, which connects the shield of the coax to the bracket connected to the mast. That shield also connects to the VHF radio which is DC grounded by its power connection. The easiest solution is to insert what is called a "inner-outer DC block" into the coax. This RF device puts a capacitor in series with the center conductor, and another capacitor in series with the shield. This device is transparent to the VHF RF signals in the center conductor and shield, but blocks any DC current in either the center conductor or shield. This device can be made by a good radio technician, or purchased from radio supply houses, pre-fitted with any kind of coax connection on both ends. The commercial units look like a coax "barrel" connector. A vendor is listed at the end of the article. Once the DC connection from the mast to the VHF is broken, check for any other connections with an ohmmeter, and straighten out any other wiring errors or unintended connections. If your metal fuel tank is also bonded to the lightning ground system (per ABYC) then make sure that it does not have DC connections either to the engine via the fuel line or to the electrical system via the fuel level sensor. A piece of approved rubber fuel hose in the fuel lines to the engine solves that connection, and a well designed fuel level sensor will not make electrical contact with the tank. When you're done, there will be heavy conductors running from the external keel or lightning ground plate to the mast, stays, and to the metal fuel tank, but there will be no DC connections to the engine or to the yacht's electrical system. See Figure 3. By using capacitors to block DC connections in a few key areas, it is possible to have perfect ground systems for AC, DC, RF, lightning, and corrosion, and have a boat that is immune to stray DC currents that are traveling through the water in "hot marinas." In the old days, the technique of bonding everything together worked okay. In its defense, the "bond everything together" approach makes your boat less sensitive to electrolytic corrosion that can result from faulty wiring on your own boat. The problem is, the "bond everything" approach leaves your boat totally defenseless to wiring errors in nearby boats and nearby industry, that cause stray DC currents to run through the water. Today the technique of bonding everything together would still work fine if your boat spent all of its time on the high seas, in remote anchorages, or in marinas that were wired perfectly and in which all of the nearby yachts were wired perfectly. Having underwater metal bonded together in crowded marina's today, however, is asking for expensive trouble. As outlined above, it is avoidable trouble. It is possible, with careful wiring and a few capacitors, to have the best of all worlds, good RF and lightning grounds, ABYC-approved DC and AC grounds, and security against electrolytic corrosion caused by hot marinas.